Fitocracy is a free (ad-supported) cloud-based service. You can create an account or login using an existing Facebook, Twitter, or Runkeeper account. You then enter some basic information, such as your height and weight (don't worry; it's kept hidden! ), and your exercise interests. Then, you're free to explore the Fitocracy community, which works in a variety of ways. Fitocracy is primarily a fitness tool. You can use it to track your workouts. You select the activity from the supplied list (you'll be hard-pressed to find an activity not on there), then enter your workout time and the distance covered (if applicable). The advanced options let frequent exercisers log multiple sessions per day, which is a nice touch. But Fitocracy doesn't include any mapping tools that runners and walkers could use to plan or log routes; rival FriendFit includes this useful feature. Fitocracy does include plenty of ways to keep you motivated, though. Every workout you track earns you points, and your points help you move through Fitocracy's Levels. You're also presented with Quests (such as run a 5K, do a dumbbell press, or log 10 fitness activities in one week) that earn you bonus points. Fitocracy has more to offer than these solo goals, however: its social aspect is what sets it apart from other workout trackers such as WalkJogRun and MapMyRun. You can search the site and add members as your friends, just as you would on Facebook. You also can use your "Feed" to see public updates from all Fitocracy members. Other members can comment on your posts and give you "props" for you accomplishments. Fitocracy calls on its community to offer even more motivational tools, such as Challenges and Duels. You can find a Challenge by joining some of the many groups Fitocracy has to offer; you'll find options ranging from "Barefoot and Minimalist Running" to "Industrial," which is a group for folks who enjoy industrial music. Groups can be competitive or social, and some are public while others are private. You can form your own group if you don't see one that meets your needs. A group owner can issue a challenge to all members of the group, who then compete for spots on Fitocracy's virtual podium. Duels are a more personal form of the challenge: one Fitocracy user can issue a challenge to another user, and the two members can them compete for victory. Fitocracy currently offers 10 types of duels, ranging from "Most Points Earned" and "Heaviest Bench Press" to "Most Distance Run. "Other users can take sides in the Duel, cheering their member on to victory. Like rival FriendFit, Fitocracy offers plenty of fun tools to keep members motivated and challenged on their fitness journey. Its mobile app (available for iOS) is a great companion, too, and it's something that FriendFit doesn't offer. However, frequent runners will appreciate FriendFit's mapping tools, which is an option that Fitocracy could benefit from. Note: The Download button takes you to the vendor's site, where you can use this Web-based software. 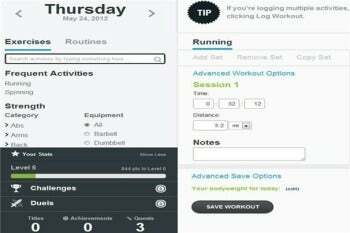 Bring a social feel to your workouts with Fitocracy, the social network for fitness.